In 1991 I met a girl at college named Rachel who lived on a ranch near Mission, SD. My friends and I were invited to her ranch for a weekend of riding horses and prairie dog hunting. The ranch had acres of grassland with miles of barbed wire fence. There were horses, prairie dogs and hay bails. Of course, three-wheelers were not allowed on the ranch. We stayed up late on Friday night so on Saturday morning I slept in, ate a large breakfast, took a shower and then walked outside. To my surprise everyone was waiting for me by the barn. I thought I looked pretty good, but all of my friends were laughing at me. My mullet was slicked back with mousse. I was sporting my gray and black sleeveless shirt that had a full length zipper down the front. My nylon shirt hung over my black nylon parachute pants. I also wore unlaced high tops. My so-called friends were wearing jeans, boots and t-shirts they had borrowed from Rachel’s brothers. I guess the early bird gets the worm. I had never ridden a horse before so I was given gentle old Betsy. Rachel said her dad used Betsy to give the grandkids rides because she was so docile. I nicknamed her Elmer. For some strange reason we did not use saddles. I believe it was laziness. I had to use a fence to board old Betsy because without a saddle there were no stirrups. At the time I was 6’8” and weighed 275 lbs. Poor Betsy seemed to quiver and tear up as I settled onto her bowing back. Rachel assured me old Betsy would not run because she was too old and she preferred to walk. Rachel gave us a tour around the homestead. She led and all of the horses followed her. I felt like a cowboy on the open range without a care in the world. Then it happened. Rachel and my friends wanted to run their horses so they took off in a cloud of dust. In light of the perfect greeting card tour of the homestead, I had loosened my grip on Betsy’s reins. All of a sudden, she jolted forward and I lost the reins completely. She started to increase speed and the nice easy going ride turned into a gallop. Betsy’s movement reminded me of a clown bobble car in a parade. I had to hold on for dear life because my nylon pants mixed with horses’ sweat made a slippery surface similar to cooking spray on a Teflon pan. I was in extreme pain but I could not say anything because I was laughing so hard. The torment lasted for about a mile then Betsy stopped dead in her tracks and would not move. I can still hear my friends laughing as I walked the gentle giant back to the barn. I met my match that day and her name was Betsy. 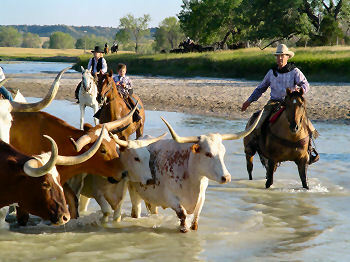 I cannot imagine riding a horse for an entire day moving cattle like the wranglers did on the open range. Their muscles must have been sore and their bones must have ached. I have always heard the cowboys of the open range were tough. My mile long experience on Betsy proved they were tougher than me. I never rode a horse again, but that hasn’t stopped me from enjoying the beautiful open range on a true West River ranch located in the great land of South Dakota.